Overview of Photos taken during Swami Mudaliandan - Varthamana Acharyan's Thirunatchathiram which was on 6 Dec 2012 (Karthikai Pooram) but celebrated on 9 Dec 2012 @ Ramanuja Koodam, Kesava Perumal Koil St, Mylapore. Our Varthmana Swamis Thirunakshatram was celebrated in a very grand manner at Sri Kesava Perumal Thiruvadivaram and also Peyazhwar Avatharasthalam. 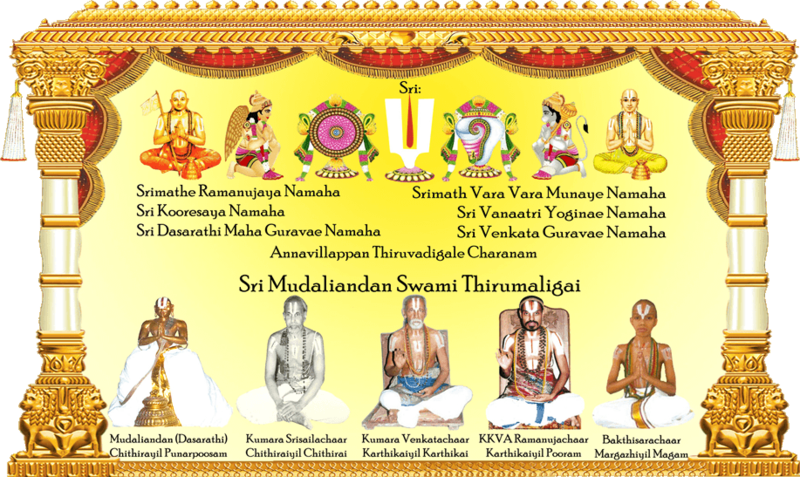 As all of you are aware, the Thirunakshtram of HH Vanamamalai Jeer Swamy and our Varthamana Swamy is on the same day. Swami had been to Vanamamalai on the Thirunakshtra day and HH Vanamamalia Jeer Swamy extended all temple honours to our Varthamana Swami and our Swamy was so happy on the special attention given to him by HH Jeer Swamy. While returning, our Swami heard that the Srinivasa Perumal Temple in Pondicherry has come back to our Thirumaligai. For a long time for reasons unknown, our Swamis could not do Kainkaryam, now the HRE Dept of Pondicherry invited our Varthamana Swami to take over the kainkaryam in the temple and that the Govt would follow his guidance in the rituals of the temple. The Thirunakshtra Festival was celebrated at Mylapore on Sunday for the convenience of all the sishyas to participate. About 260 to 300 Sishyas and abhimanis participated. The Chairman of Kesava Perumal Koil, Sri Sridharan N.C. was present and ensured the temple honours were extended to our Swami, Chinna Swami assisted our Swami in Thiruaradhana to our Thirumaligai Perumals. Special Prasadmas were arranged and about 25 of our Sishyas also had Samashrayanam.